The latest spin-off in the Conjuring universe takes us to a cloistered abbey in Romania back in 1952. 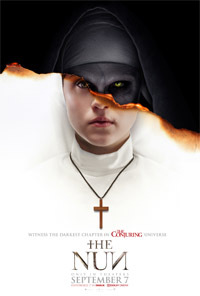 A young nun has committed suicide and the Catholic Church sends a priest [Demián Bichir] and a novice nun [Taissa Farmiga] to investigate what is going on in what appears to be an unholy place. They get help from a local man named Frenchie [Jonas Bloquet], who initially had discovered the dead nun. The movie is never scary, apart from a few generic jump-scares, and at times it's borderline comedy, Frenchie's character in particular. The plot is a bit thin and some of it makes little sense, but the actors do an okay job. It's fine entertainment most of the way, but I can't help feeling a bit disappointed that it's never scary at all. It's good to learn more about the nun we met in "The Conjuring 2" , but the ancient abbey provides a nice setting for what could and should have been a way more creepy story about the demon Valak. This movie doesn't really manage to hit the atmosphere that is set in the two "The Conjuring" movies and also in "Annabelle: Creation" . It is however better than the total crap that was "Annabelle" .